Have you ever been in a situation where more work is coming in then going out and the number of tasks adding up starts to get overwhelming? So, you develop a plan. You know you need to work on your presentation for next week, you’ve got to submit your request before the budget deadline, your boss has asked for a status update on your project, and the list goes on. If you buckle down today, you can really make some progress on your to do list. You sit down at your desk to get started and open your email inbox. It already shows over a dozen unread messages, a coworker stops by to talk about their weekend, and the glare from your voicemail light is hitting you right in the eyes. You feel your day stating to slip away. Does any of this sound familiar? Many an office worker’s day has started out like this. Your plan to accomplish your priorities falls apart before it gets started. You find yourself spinning your wheels trying to tackle the variety of tasks on your plate without getting to the work you really need to get done. One of the ways you can find success at sticking to a daily plan is by making a Kanban board. Take control of your work day by creating one for yourself! Kanban is a term for signboard or billboard in Japanese. A Kanban board is a tool that helps users see all of their tasks or projects and the status of each at one time. It shows the flow of work from beginning to end. The use of Kanban boards comes from the lean approach of the Toyota Production System designed to help teams eliminate waste and increase efficiency in the manufacturing process to maximize value for customers and profit for the company. Kanban boards are one of the lean management tools that has made the jump from the production floor to the business office over the last thirty years. A Kanban board is not just for companies or work teams. It can be a powerful task and time management tool for you, too! It creates a simple visual display of your tasks and helps you focus on your priorities. Getting started is easy with only a few supplies and ten to fifteen minutes of your time. Search on the web and you’ll find endless variations of Kanban boards from the simple to the complex. You can make it what you want to work for your needs. Our days are complex enough. Start with something simple that won’t be a chore to use. Checkout this elegantly simple example from Simpatico Design Studio. It is as straight forward as they get. 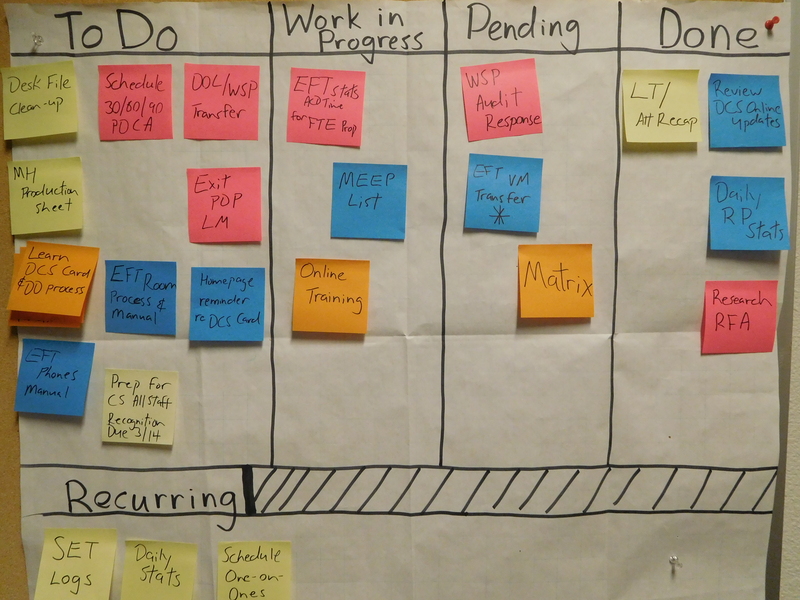 On the other-hand this digital Kanban board from Vertex42 shows how sophisticated they can be. Label each column with the stages “To Do,” “In Progress,” “Pending,” and “Done” in that order. Move tasks to the “In Progress” column that you’ll be working on for the day and you are off and running. The “Pending” column is for tasks that you’ve worked on but are waiting for something else to happen before you can finish it (e.g. waiting for input from a colleague, needed information to become available, a meeting to occur, supervisor approval, etc.) Once, you’ve completed your task move it to the “Done” column. Mission Accomplished! You’ll feel great as you see tasks pile up in your “Done” column. There are a couple keys to making a Kanban board sustainable. Limit the number of items you put in the “In Progress” column to narrow your focus to no more than three things at a time. Much more and you run the risk of spreading yourself too thin. If you knock them out, you can always add more. Checking it first thing in the morning is a great way to find your bearings for the day. Put your Kanban board in a place where you will see it throughout your day. It serves as a reminder of the things you set out to accomplish and helps keep you on track! The benefit of a Kanban board is it helps you visualize your tasks all at once. This makes it easier to plan your work day and it serves as a visual reminder of what you should be working on in the face of daily distractions. You are also less likely to lose track of tasks as new items get added to your plate. Start using a Kanban board today and your boss will be noting how organized and productive you are in no time. Ron is a 15 year public sector professional and has a broad range of office work experience.